The proposal for Madrid Castellana Norte aims to transform a vast, 500-hectare tract of neglected land close to Chamartín railway station. Constituting the most significant regeneration plan for Madrid in over 20 years, and one of the largest scale masterplans in Europe, the project also involves the renewal of the area’s transport infrastructure. Key to Grant Associates’ landscape strategy is the creation of a green corridor that will act as a spine for the whole district. The spine will be a continuation of ‘El Paseo del Castellana’ – Madrid’s main thoroughfare and promenade. The idea is to restore a pedestrian character to this most northern stretch of Paseo de la Castellana, and create a gateway to El Monte de El Pardo, a protected forest parkland lying just a few kilometres northwest beyond the city limits. New green parks will serve to link the different neighbourhoods of the new district, as well as providing 15km of cycle paths. The parks will feature a variety of tree-like, geometric canopy structures that offer shade, shelter and visual interest. These ‘Fractal Trees’ will complement a series of water features that also aim to mitigate Madrid’s hot summer months. The parks will furthermore break up the linearity of the masterplan by extending out from Paseo de la Castellana in a series of wave like formations, with larger green spaces at the core of the neighbourhoods, diffusing into smaller spaces towards their edges. 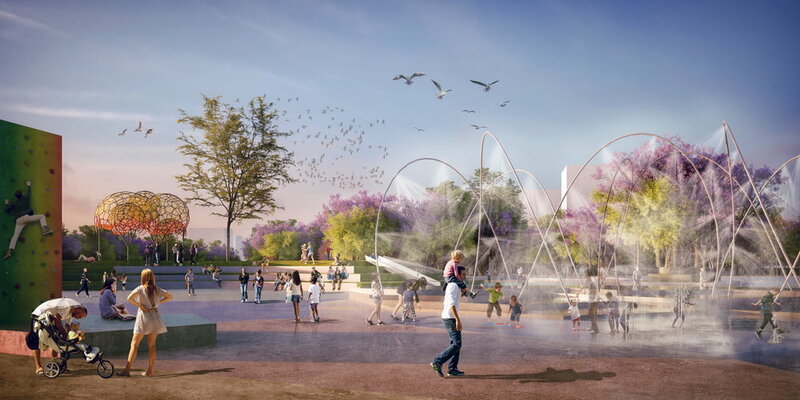 The exact design detail for each park will constitute a distinct and recognisable space, mirroring the diverse topography of Madrid and its varied urban fabric. North Madrid’s existing, fragmented network of roads and railway lines will be replaced with a layout that integrates and unifies transport systems. Chamartín station will become a transport hub with improved links to the city’s airport. The overall aim of the Madrid Castellana Norte masterplan is to create a model of 21st century urban sustainability, able to attract international investment to the district at the same time as being an attractive, green place for people to enjoy.